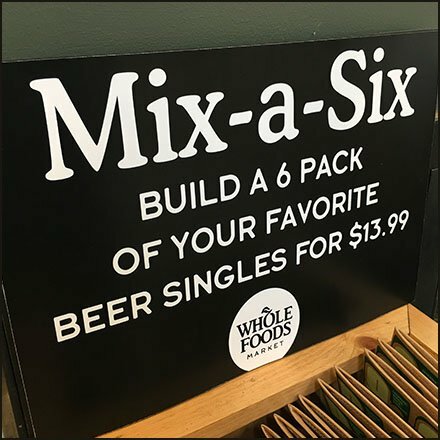 Whole Foods is not shy with its Mix-a-Six Pack Craft Beer Merchandising. Though the half-height Shelf Unit is small and compact, it is stocked to the max with 6-pack carriers so you can craft your dream assortment. Wether 2 bottles for each of the three daily meals or 6 for a night of NetFlicks the choice is yours. And there are enough carriers for weekly or even monthly purchase. The wood millwork of the Shelf Unit goes well with the natural appeal of Whole Foods outfitting. This Mix-a-Six Pack Craft Beer Merchandising seen in Allentown PA.